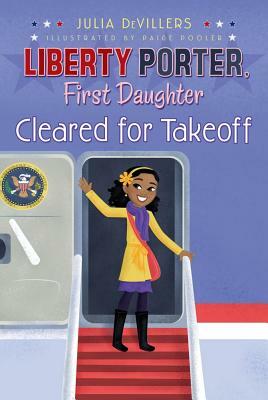 Liberty Porter, First Daughter is taking her White House antics overseas! When your father is the President of the United States, and you’ve taken your own oath to represent the kids of America…well, that's a lot of responsibility for one girl. Luckily, Liberty Porter is up to the job! There’s no problem too big or too small that can’t be solved with a visit to the White House chocolate shop and the help of your own Secret Agent Man. Now Liberty is boarding Air Force One and taking her message to the world: She’s going with her parents to Tbilisi, Georgia. But don’t tell Liberty—she can’t keep a secret! And what if Liberty accidentally causes a diplomatic disaster? Could her father’s first overseas trip end up being an international scandal? When Liberty is around, you can only count on one thing: fun. Julia DeVillers is the author of How My Private, Personal Journal Became a Bestseller, which was adapted as a Disney Channel Original Movie. She is also the author of the Liberty Porter, First Daughter series and the coauthor of the Trading Faces series, written with her twin sister, Jennifer Roy. Paige Pooler lives in Los Angeles with her First Dog, Mitzi the Boston terrier.